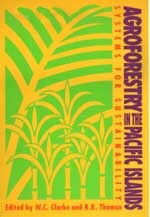 Agroforestry was introduced into the UNU programme in 1977 as part of its subprogramme on the Ecological Basis for Rural Development in the Humid Tropics, which was aimed at helping to improve the socio-economic conditions of the small-scale farmer while simultaneously developing ecologically sound production methods. Under the current UNU programme, research pertaining to agroforestry finds its place under the programme on Global Life Support Systems. One of the central concerns of this programme is local and regional ecological sustainability through environmental and resources management. This book is a product of extensive field research initiated under the programme and funded by the United Nations University.